A 2005 trailer for Tony Hawk’s American Wasteland shows the eponymous skateboarding icon riding around Los Angeles in typical freewheeling fashion until, suddenly, he’s knocked off his board by a giant, real life loading screen. “This has gotta go”, Hawk says winkingly, before the trailer cuts to raw gameplay showcasing American Wasteland’s digital rendition of The Big Orange, which claimed to be “the first skating game with no loading screens” in sight. The fact that this was the key USP of American Wasteland shows you how much of a blight the familiar loading bar was to the player experience back then but, even with all the evolutions made in technology over the 14 years since, games don’t just still have load times, they’re longer than they’ve ever been. What gives? Video games have conquered so many of their own technological demons in the last half century, so why are we still stuck in the dark ages when it comes to that dreaded loading screen? "Load times get longer because art assets are bigger, more sophisticated, and require more memory"
Right, but how did American Wasteland - which was very much a big budget title for its time - achieve a loading screen free experience all the way back in 2005? Flores elaborates on the tricks Neversoft pulled off to reach this ambitious goal post, explaining that “American Wasteland was the first Tony Hawk game that had streamed levels." In other words, American Wasteland did have loading screens, but it tricked the player into thinking they weren’t there by funneling them into mandatory “loading tunnels” that could render new zones as they were travelling (very slowly) towards them. Game developers deploy these optical illusions all the time to hide their loading process without cutting to an inanimate screen, tricking the player into thinking they’re just enjoying a slightly sedated, more linear part of the experience. Remember when Gears of War made Marcus slow down to walking pace and talk to his buddies over the radio coms? Or the infamous elevator trip in Mass Effect (not so subtle, that one)? Or, to venture into even more recent territory, how about the Tree of Life in God of War? What, you thought activating its realm-hopping machinery every time the story required Kratos to venture to distant lands was just a conveniently plodding plot device? Lift back the curtain on each of these moments, and you’ll find the game’s code scuttling around like stage managers arranging props on a theatre set, desperately working to put everything in place before players even begin to notice they’re being held up. Jak & Daxter was one of the earliest games to adopt this seamless loading technique, and Naughty Dog’s co-founder Andy Gavin describes the techniques employed by the studio while working on the iconic platformer as a Producer. Some games, however, do stick with the more traditional loading screen, but turn the format on its head through subtle subversions of their various tropes. Spec Ops: The Line is a third-person shooter in which protagonist Martin Walker begins to lose his sanity against the backdrop of an unjust war, and developer Yager uses the classics “Tips” section of the game’s loading screens as a way to reflect the character’s devolving state of mind over the course of the campaign. “We had big levels that needed to be loaded”, explains Mathias Wiese, Spec Ops: The Line’s original Art Director, “and unfortunately that meant that people had to wait before they could continue playing. But, as we had to deal with this issue, we wanted to have the loading screens and tips be in line with the overall experience." We should encourage developers to follow in the footsteps of Yager's innovativeness because, for better or worse, loading times are here to stay in video games, and may even get longer as developers continue to expand on their scope, pumping more and more assets into their experiences well beyond what the current generation of processors can manage. 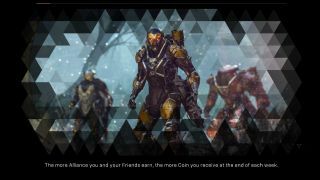 However, developing techniques around streaming, and avant-garde artistic devices that hides loading behind the illusion of gameplay, means we could soon reach a day when traditional loading screens - like the one Anthem players are used to looking at right now - are gone for good. Either that, or developers continue to play with the trope as a subtextual tool for storytelling, as was the case with Spec Ops: The Line. Ultimately, we’ll have to wait and see what the future of loading screens really looks like, but hey, at least we’re all pretty used to waiting by now. Want to know how else video games have been deceiving you? Discover the 22 hidden game techniques will blow your mind and completely change the way you play.